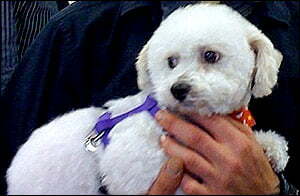 A small white dog has become lost in the snow in the US town of Arnold. Rich is a tiny white Bichon Frise (who used to be a stud dog) and looks a lot like a toy poodle. He was being fostered by caretaker owners when he escaped out of the door, into the snow, last week and hasn’t been seen since. It’s just one of those things that can happen when a foster parent has a dog that is a darter. There have been sightings of the dog throughout the weekend, but no one has managed to catch him as he’s afraid of people and is very quick, even in the snow. I guarantee you, nobody can catch him. Rich is a 6 year old Bichon, and came from a puppy mill, where he was a stud dog. In the puppy mill Rich was fed by machines and rarely saw people. He was rescued from the puppy mill by Small Paws Rescue, who managed to find a foster home for the dog. He’s been getting really good with his foster mother. Somebody could possibly think he was part poodle, part weenie dog. Anyone who spots Rich is asked to call Animal Control rather than try to catch him. There is a reward for his safe recovery.